An incandescent light bulb and its glowing filament. The incandescent light bulb or incandescent lamp is a source of artificial light that works by incandescence. An electrical current passes through a thin filament, heating it and causing it to become excited, releasing light in the process. The enclosing glass bulb prevents oxygen of the air from reaching the hot filament, which would otherwise be rapidly oxidized and destroyed. 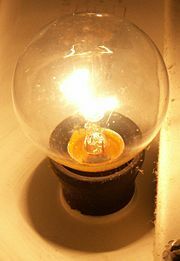 Incandescent bulbs constitute a class of electric lamps, extending the use of a term applied to the original arc lamps. In Australia and South Africa, they are also called light globes or light bulbs. An advantage of the incandescent bulbs is that they can be produced for a wide range of voltages, from a few volts to several hundred volts. On the other hand, given their relatively poor luminous efficacy, incandescent light bulbs are gradually being replaced in many applications by (compact) fluorescent lights, high-intensity discharge lamps, LEDs, and other devices. A scanning electron microscope image (75x) of a 60-watt line voltage light bulb filament. 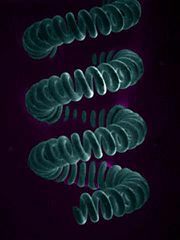 In order to increase the filament length while keeping its physical size small, the filament takes the form of a coiled coil. By comparison, low voltage lamp filaments usually take the form of a single coil. Incandescent light bulbs consist of a glass enclosure (the envelope, or bulb). An inert gas reduces evaporation of the filament and reduces the required strength of the glass. Inside of the bulb is a filament of tungsten wire, through which an electrical current is passed. The current heats the filament to an extremely high temperature (typically 2000 to 3300K depending on the filament type, shape, and amount of current passed through). Heated electrons in the continuous energy bands of tungsten become excited and then transition to lower energy states of the solid. As they do, they release thermally equilibrated photons which have a black body spectrum. This spectrum, unlike those caused by non-equilibrium atomic or molecular transitions, such as in a mercury-vapor lamp, is continuous, typically peaking in the visible light spectrum, but also containing significant energy in the near-infrared wavelengths. Incandescent light bulbs usually also contain a glass mount on the inside, which supports the filament and allows the electrical contacts to run through the envelope without gas/air leaks. Many arrangements of electrical contacts are used, such as a screw base (one or more contacts at the tip, one at the shell), a bayonet base (one or more contacts on the base, shell used as a contact or only used as a mechanical support), and for some lamps, an electrical contact at either end of a tubular lamp. Contacts in the lamp socket allow the electrical current to pass through the filament. Power ratings range from about 0.1 watt to about 10,000 watts, and up. To improve the efficacy of the lamp, the filament usually consists of coils of fine wire, also known as a "coiled coil." For a 60 watt 120-volt lamp, the length of the filament is usually 6.5 feet or 2 meters. One of the smallest problems of the standard electric light bulb is evaporation of the filament. The largest problem is that the inevitable variations in resistivity along the filament cause non-uniform heating, with "hot spots" forming at points of higher resistivity. Thinning by evaporation increases resistivity. But hot spots evaporate faster, increasing their resistivity faster—a positive feedback which ends in the familiar tiny gap in an otherwise healthy-looking filament. Irving Langmuir suggested that an inert gas, instead of vacuum, would retard evaporation and still avoid combustion, and so ordinary incandescent light bulbs are now filled with nitrogen, argon, or krypton. However, a filament breaking in a gas-filled bulb can pull an electric arc, which may spread between the terminals and cause very heavy current flow; intentionally thin lead-in wires or more elaborate protection devices are therefore often used as fuses built into the light bulb. During ordinary operation, the tungsten of the filament evaporates; hotter, more-efficient filaments evaporate faster. Because of this, the lifetime of a filament lamp is a trade-off between efficiency and longevity. The trade-off is typically set to provide a lifetime of 750-1000 hours for ordinary lamps. In a conventional (not halogen) lamp, the evaporated tungsten eventually condenses on the inner surface of the glass envelope, darkening it. For bulbs that contain a vacuum, the darkening is uniform across the entire surface of the envelope. When a filling of inert gas is used, the evaporated tungsten is carried in the thermal convection currents of the gas, depositing preferentially on the uppermost part of the envelope and blackening just that portion of the envelope. Some old, high-powered lamps used in theater, projection, searchlight, and lighthouse service with heavy, sturdy filaments contained loose tungsten powder within the envelope. From time to time, the operator would remove the bulb and shake it, allowing the tungsten powder to scrub off most of the tungsten that had condensed on the interior of the envelope, removing the blackening and brightening the lamp again. 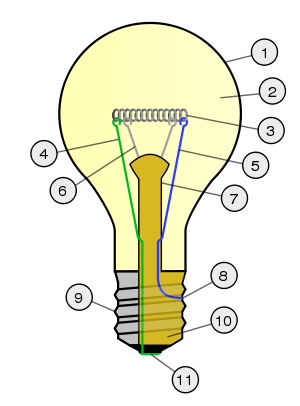 When a light bulb envelope breaks while the lamp is on or if air leaks into the envelope, the hot tungsten filament reacts with the air, yielding an aerosol of brown tungsten nitride, brown tungsten dioxide, violet-blue tungsten pentoxide, and yellow tungsten trioxide which then deposits on the nearby surfaces or the bulb interior. While conversion of electrical energy to light was demonstrated in laboratories as early as 1801, it took more than 100 years for the modern form of electric light bulb to be developed, with the contributions of many inventors. Many inventors had a hand in the development of a practical device for the production of electric light. In 1801 Sir Humphry Davy, an English physician, made platinum strips glow by passing an electric current through them, but the strips evaporated too quickly to make a useful light source. The problem of the filament burning out after a few minutes, and the low resistance and high current draw made incandescent lamps a failure in practical terms until the developments by Edison and Swan in the 1870s. In 1809 Davy created the first arc lamp by creating a small but blinding electrical connection between two charcoal rods connected to a battery. Demonstrated to the Royal Institution of Great Britain in 1810, the invention came to be known as the Arc lamp. In 1835, James Bowman Lindsay demonstrated a constant electric light at a public meeting in Dundee, Scotland. He stated that he could "read a book at a distance of one and a half feet." However, having perfected the device to his own satisfaction, he turned to the problem of wireless telegraphy and did not develop the electric light any further. His claims are not well documented. In 1840, the British scientist Warren de la Rue(1815-1889) enclosed a platinum coil in a vacuum tube and passed an electric current through it. The design was based on the concept that the high melting point of platinum would allow it to operate at high temperatures and that the evacuated chamber would contain less gas molecules to react with the platinum, improving its longevity. Although it was an efficient design, the cost of the platinum made it impractical for commercial use. In 1841, Frederick de Moleyns of England was granted the first patent for an incandescent lamp, with a design using powdered charcoal heated between two platinum wires contained within a vacuum bulb. In 1845, American John Wellington Starr acquired a patent for his own incandescent light bulb involving the use of carbon filaments. He died shortly after obtaining the patent. Aside from the information contained in the patent itself, little else is known about him. In 1851, Robert Houdin publicly demonstrated incandescent light bulbs on his estate in Blois, France. His light bulbs are on permanent display in the museum of the Chateau of Blois. In 1872, Alexander Nikolayevich Lodygin invented an incandescent light bulb. In 1874, he got a patent for his invention. In 1893, the German inventor Heinrich Göbel claimed he had developed the first light bulb in 1854: A carbonized bamboo filament, in a vacuum bottle to prevent oxidation, and that in the following five years he developed what many call the first practical light bulb. Joseph Wilson Swan (1828–1914) was a physicist and chemist born in Sunderland, England. In 1850, he began working with carbonized paper filaments in an evacuated glass bulb. By 1860 he was able to demonstrate a working device, but the lack of a good vacuum and an adequate supply of electricity resulted in a short lifetime for the bulb and an inefficient source of light. By the mid-1870s better pumps became available, and Swan returned to his experiments. Swan received a British patent for his device in 1878. Swan reported success to the Newcastle Chemical Society, and at a lecture in Newcastle, in February 1873, he demonstrated a working lamp that utilized a carbon fiber filament, but by 1877, he had turned to slender rods of carbon. The most significant feature of Swan's lamp was that there was little residual oxygen in the vacuum tube to ignite the filament, thus allowing the filament to glow almost white-hot without catching fire. From this year he began installing light bulbs in homes and landmarks in England, and by the early 1880s he had started his own company. In North America, parallel developments were also taking place. On July 24, 1874, a Canadian patent was filed for the Woodward and Evans Light by a Toronto medical electrician named Henry Woodward and colleague Mathew Evans. They built their lamps with different sizes and shapes of carbon filaments held between electrodes in glass globes filled with nitrogen. Woodward and Evans attempted to commercialize their bulb, but were unsuccessful. Nonetheless, Thomas Edison considered their approach sufficiently promising and bought the rights to both their Canadian and U.S. patents for $5000USD before embarking on his own light bulb development program. To get enough grant money, Edison told the press that he had already invented the light bulb and that he needed money to produce it. After many experiments with platinum and other metal filaments, Edison returned to a carbon filament (the first successful test was on October 21, 1879; it lasted 13.5 hours). Edison continued to improve this design and by 1880 had the patent for a lamp that could last over 1200 hours using a carbonized bamboo filament. Edison and his team did not find this commercially viable filament until more than six months after Edison filed the patent application. In January 1882, Lewis Latimer received a patent for the "Process of Manufacturing Carbons," an improved method for the production of light bulb filaments which was purchased by the United States Electric Light Company. In Britain, the Edison and Swan companies merged into the Edison and Swan United Electric Company (later known as Ediswan, which was then incorporated into Thorn Lighting Ltd). Edison was initially against this combination, but after Swan sued him and won, Edison was eventually forced to cooperate, and the merger was made. Eventually, Edison acquired all of Swan's interest in the company. Swan sold his United States patent rights to the Brush Electric Company in June 1882. Swan later wrote that Edison had a greater claim to the light than he, in order to protect Edison's patents from claims against them in the United States. The United States Patent Office gave a ruling October 8, 1883, that Edison's patents were based on the prior art of William Sawyer and were invalid. Litigation continued for a number of years. Eventually on October 6, 1889, a judge ruled that Edison's electric light improvement claim for "a filament of carbon of high resistance" was valid. In addressing the question "Who invented the incandescent lamp?" historians Robert Friedel and Paul Israel (1987, 115-117) list 22 inventors of incandescent lamps prior to Swan and Edison. They conclude that Edison's version was able to outstrip the others because of a combination of factors: An effective incandescent material, a higher vacuum than others were able to achieve and a high resistance lamp that made power distribution from a centralized source economically viable. Another historian, Thomas Hughes, has attributed Edison's success to the fact that he invented an entire, integrated system of electric lighting. "The lamp was a small component in his system of electric lighting, and no more critical to its effective functioning than the Edison Jumbo generator, the Edison main and feeder, and the parallel-distribution system. Other inventors with generators and incandescent lamps, and with comparable ingenuity and excellence, have long been forgotten because their creators did not preside over their introduction in a system of lighting" (Hughes 1977, 9). In the 1890s, the Austrian inventor Carl Auer von Welsbach worked on metal-filament mantles, first with platinum wiring, and then osmium, and produced an operative version in 1898. In 1897, German physicist and chemist Walther Nernst developed the Nernst lamp, a form of incandescent lamp that used a ceramic globar and did not require enclosure in a vacuum or inert gas. Twice as efficient as carbon filament lamps, Nernst lamps were briefly popular until overtaken by lamps using metal filaments. In 1903, Willis Whitnew invented a filament that would not blacken the inside of a light bulb. (Some of Edison's experiments to stop this blackening led to the invention of the electronic vacuum tube.) It was a metal-coated carbon filament. In 1906, the General Electric Company was the first to patent a method of making tungsten filaments for use in incandescent light bulbs. In the same year Franjo Hannaman, a Croatian from Zagreb, invented a tungsten (wolfram) filament lamp, which lasted longer and gave a brighter light than the carbon filament. Tungsten filaments were costly, but by 1910 William David Coolidge (1873–1975) had invented an improved method of making tungsten filaments. The tungsten filament outlasted all other types of filaments and Coolidge made the costs practical. Marvin Pipkin, an American chemist, in 1924 patented a process for frosting the inside of lamp bulbs without weakening them, and in 1947 patented a process for coating the inside of lamps with silica. 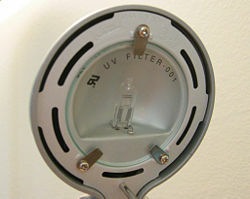 A Halogen lamp behind a round UV filter. One invention that addressed the problem of short lamp life was the halogen lamp, also called the tungsten-halogen lamp, the quartz-halogen lamp, or the quartz-iodine lamp, wherein a tungsten filament is sealed into a small envelope filled with a halogen gas such as iodine or bromine. In an ordinary incandescent lamp, the thickness of the filament may vary slightly. The resistance of the filament is higher at the thinner portions which causes the thin areas to be hotter than the thicker parts of the filament. The rate of tungsten evaporation will be higher at these points due to the increased temperature, causing the thin areas to become even thinner, creating a runaway effect until the filament fails. A tungsten-halogen lamp creates an equilibrium reaction in which the tungsten that evaporates when giving off light is preferentially re-deposited at the hot-spots, preventing the early failure of the lamp. This also allows halogen lamps to be run at higher temperatures, which would cause unacceptably short lamp lifetimes in ordinary incandescent lamps, allowing for higher luminous efficacy, apparent brightness, and whiter color temperature. Because the lamp must be very hot to create this reaction, the halogen lamp's envelope must be made of hard glass or fused quartz, instead of ordinary soft glass which would soften and flow too much at these temperatures. The envelope material can be selected and modified (by means of optical coating) to achieve whatever lamp characteristics are required. Halogen bulbs are widely used in automobile headlamps, for example, and because headlamps often contain plastic parts, halogen headlamp bulbs' envelopes are made out of hard glass, or out of quartz "doped" with additives to block most of the UV output (hard glass blocks UV without need of dopants). Conversely, some applications require ultraviolet radiation, and in such cases, the lamp envelope is made out of undoped quartz. Thus, the lamp becomes a source of UV-B radiation. Undoped quartz halogen lamps are used in some scientific, medical, and dental instruments as a UV-B source. A typical halogen lamp is designed to run for about 2000 hours, twice as long as a typical incandescent lamp. A further development that has added to halogen lamp efficacy is an infrared-reflective coating (IRC). The quartz envelope is coated with a multi-layered dichroic coating which allows visible light to be emitted while reflecting a portion of the infrared radiation back onto the filament. Such lamps are called halogen-infrared lamps, and they require less power than standard halogen lamps to produce any given light output. The efficiency increase can be as much as 40 percent when compared to its standard equivalent. Because the halogen lamp operates at very high temperatures, it can pose fire and burn hazards. Additionally, it is possible to get a sunburn from excess exposure to the UV emitted by an undoped quartz halogen lamp. To mitigate the negative effects of unintentional UV exposure, and to contain hot bulb fragments in the event of explosive bulb failure, manufacturers of lamps intended for general-purpose usage usually install UV-absorbing glass filters over or around the bulb. Alternatively, they may add a coating of UV inhibitors on the bulb envelope that effectively filters UV radiation. When this is done correctly, a halogen lamp with UV inhibitors will produce less UV than its standard incandescent counterpart. Any surface contamination, notably fingerprints, can damage the quartz envelope when it is heated, by causing the quartz to change from its vitreous form into a weaker, crystalline form which leaks gas. Consequently, quartz lamps should be handled without touching the clear quartz, either by using a clean paper towel or carefully holding the porcelain base. If the quartz is contaminated in any way, it must be thoroughly cleaned with rubbing alcohol and dried before use. Otherwise, oil from your fingerprints will create a hot spot on the bulb surface which may cause the bulb to form a bubble, thereby weakening the bulb. The incandescent lamp is still widely used in domestic applications, and is the basis of most portable lighting, such as table lamps, some car headlamps and electric flashlights. Halogen lamps have become more common in auto headlamps and domestic situations, particularly where light is to be concentrated on a particular point. The fluorescent light has, however, replaced many applications of the incandescent lamp with its superior life and energy efficiency. LED lights are beginning to see increased home and auto use, replacing incandescent lamps. Approximately 95 percent of the power consumed by an incandescent light bulb is emitted as heat, rather than as visible light. An incandescent light bulb, with this ~5 percent efficiency, is about one quarter as efficient as a fluorescent lamp (about 20 percent efficiency), and produces about six times as much heat with the same amounts of light from both sources. One reason why incandescent lamps are unpopular in commercial spaces is that the heat output results in the need for more air conditioning in the summer. Proponents claim that the heat which incandescent bulbs emit may remove some of the burden of heating a room from a thermostatically-controlled system, particularly at night and during cold periods of the year. However, the amount of heat produced by a single household bulb is negligible for this purpose. Incandescent lamps can usually be replaced by self-ballasted compact fluorescent light bulbs, which fit directly into standard sockets (but contain mercury, and thus should not be disposed of in a regular trash can). This lets a 100 watt incandescent lamp be replaced by a 23 watt fluorescent bulb, while still producing the same amount of light. Quality halogen incandescents are closer to 9 percent efficiency, which will allow a 60 W bulb to provide nearly as much light as a non-halogen 100 W. Also, the lower wattage halogen lamp can be designed to produce the same amount of light as a 60 W non-halogen lamp, but with much longer life. However, small halogen lamps are often still high-power, causing them to get extremely hot. This is both because the heat is more concentrated on the smaller envelope surface, and because the surface is closer to the filament. This high temperature is essential to their long life (see the section on halogen lamps above). Left unprotected, these can cause fires much more easily than a regular incandescent, which may only scorch easily flammable objects such as drapery. Most safety codes now require halogen bulbs to be protected by a grid or grille, or by the glass and metal housing of the fixture. Similarly, in some areas, halogen bulbs over a certain wattage are banned from residential use. LED-based lighting is becoming common, because it offers very high efficiency. A 3 W, 120 VAC LED bulb can replace at least a 15 W incandescent bulb and will last 60 times longer than the incandescent bulb. In the long run, LED bulbs save money, despite costing more up front than incandescents. Compared to fluorescent bulbs they contain smaller quantities of harmful metals such as mercury. One problem with wholesale replacement of incandescent bulbs with compact fluorescents is the poor tolerance for extreme cold by the compact fluorescents, which may fail to operate properly at low temperatures. Light output drops at low temperatures, and they may not light at all below zero degrees C (32 degrees F). They also have unacceptably short life when switched on and off frequently. Incandescent bulbs operate well with no loss of brightless at extremely low or high temperatures and can better withstand frequent turning on and off, as in security light applications. In January of 2007, California State Assembly member Lloyd E. Levine (D-Van Nuys) announced that he would introduce the "How Many Legislators does it take to Change a Light Bulb Act" (a reference to light bulb joke), which would ban the sale of incandescent light bulbs in California starting in 2012. A few days later, Connecticut state Representative Mary M. Mushinsky (D-Wallingford) proposed a similar ban for the state of Connecticut. On February 8, 2007, New Jersey Assemblyman Larry Chatzidakis introduced a bill that calls for the state to switch to fluorescent lighting in government buildings over the next three years. "The light bulb was invented a long time ago and a lot of things have changed since then," said Chatzidakis. "I obviously respect the memory of Thomas Edison, but what we're looking at here is using less energy." On February 20, 2007, Australian Prime Minister John Howard and Environment Minister Malcolm Turnbull announced that by 2010, incandescent light bulbs would be banned in Australia. In response, New Zealand is considering similar measures. Climate Change Minister David Parker said: "The Australians are talking about looking at banning ordinary light bulbs in three years' time…I think by the time that is implemented in Australia—if it is—we will be doing something very similar". The Province of Ontario, Canada, is also considering banning incandescent light bulbs. The Provincial government of Nova Scotia, Canada would also like to move towards phasing out incandescent light bulbs in the province. However, Energy Minister Bill Dooks said he expects it would be four or five years before a ban is in place. The European Union is currently studying an incandescent light bulb ban. Germany’s Environment Minister Sigmar Gabriel has urged the European Commission to ban inefficient light bulbs in the European Union in the fight against global warming. The EU could reduce carbon dioxide emissions by 25 million metric tons a year if energy saving light bulbs were used in both the domestic and services sectors. Belgium's Minister of the Environment Bruno Tobback is intent on banning old-fashioned incandescent light-bulbs, and thinks the ban on incandescent light-bulbs should be included in the list of measures under the Kyoto Protocol. Energy Minister Kris Peeters supports this position as well. The Netherlands is moving ahead with plans to ban incandescent light bulbs as well. Candelabra screw base, used in nightlights and Christmas lights, and by some halogen bulbs. MES or medium Edison screw (E26), used in North America and Japan for most 120 and 100-volt lamps. A slight variant of this base, E27, is used in Europe and elsewhere in the world with 220-240V household voltage. G4 or GY4 for dualpin/bipin (looks like a miniature wall connector) halogen lamps with the number being the center-to-center distance in millimeters. R7S-75 for halogen lamptubes, in this case a 7 mm diameter socket with 75 mm tube length. mogul: E39 North America, E40 (GoliathES) in Europe). There is also a rare "admedium" size (E29), incompatible with standard and used to frustrate thieves of bulbs used in public places; and a very miniature size (E5) generally used only for low-voltage applications such as with a battery. The largest size is now only used in large street lights, however a few high-wattage household lamps (such as a 100/200/300-watt three-way) used this at one point. MES bulbs for 12 volts are also produced for recreational vehicles. Large outdoor Christmas lights use an intermediate base, as do some desk lamps and many microwave ovens. Emergency exit signs also tend to use the intermediate base. Bulbs with a bayonet (push-twist) base, for use with sockets having spring-loaded base plates, are produced in similar sizes and are given a B or BA designation. These are also extremely common in 12-volt automobile lighting worldwide, in addition to wedge-base ones which have a partial plastic or even completely glass base. In this case, the wires wrap around to the outside of the bulb, where they press against the contacts in the socket. Miniature Christmas bulbs use a plastic wedge base as well. Halogen bulbs are available with a standard fitting, but also come with a pin base, with two contacts on the underside of the bulb. These are given a G or GY designation, with the number being the center-to-center distance in millimeters. For example, a 4 mm pin base would be indicated as G4 (or GY4). Some common sizes include G4 (4 mm), G6.35 (6.35 mm), G8 (8 mm), GY8.6 (8.6 mm), G9 (9 mm), and GY9.5 (9.5 mm). The second letter (or lack thereof) indicates pin diameter. Some spotlights or floodlights have pins that are broader at the tips, in order to lock into a socket with a twist. Other halogen bulbs come in a tube, with blades or dimples at either end. Fluorescent tubes use a different set of pins, but self-ballasted compact fluorescents are available in both medium and candelabra-base bulbs, intended to replace incandescents. There are also various odd fittings for projectors and stage lighting instruments. Projectors, in particular, may run on odd voltages (such as 82), perhaps intended as a vendor lock-in. General Electric introduced standard fitting sizes for tungsten incandescent lamps under the Mazda trademark in 1909. This standard was soon adopted across the United States, and the Mazda name was used by many manufacturers under license through 1945. Incandescent light bulbs are usually marketed according to the electrical power consumed. This is measured in watts and depends mainly on the resistance of the filament, which in turn depends mainly on the filament's length, thickness and material. It is difficult for the average consumer to predict the light output of a bulb given the power consumed but it can be safely assumed, for two bulbs of the same type, color, and clarity, that the higher-powered bulb is brighter. Light output ratings are given in lumens, although most buyers do not check for this. Some manufacturers engage in deceptive advertising, such that the claimed "long" bulb life is achievable at normal household voltages, but the claimed light output is only attainable at a higher voltage which is not normally available in a household setting, such as 130 volts in the United States. The table shows the approximate typical output, in lumens, of standard incandescent light bulbs at various powers. Note that the lumen values for "soft white" bulbs will generally be slightly lower than for standard bulbs at the same power, while clear bulbs will usually emit a slightly brighter light than correspondingly-powered standard bulbs. Also note that the 34, 52, 67, 90, and 135 watt bulbs in the chart are listed for use at 130 volts. Since it is impossible (and in fact against electrical codes) to get 130 volts from any normal mains, these typically run at a more realistic 115 volts in North America. By dropping the voltage by 12 percent, the current also drops (non-linearly) by approximately 7 percent, reducing the actual wattage by about 18 percent. This in turn reduces the light output by 34 percent, but also increases the bulb's service life by a factor of 7. This is the concept of the "long-life bulb." A kilowatt-hour is a unit of energy, and this is the unit in which electricity is purchased. The cost of electricity in the United States normally ranges from $0.07 to $0.13 per kilowatt-hour (kWh), but can be as high as $0.26 per kWh in certain areas such as Alaska and Hawaii, where Compact Fluorescent light bulbs are particularly popular. The following shows how to calculate total cost of electricity for using an incandescent light bulb vs. a compact fluorescent light bulb. (Also note that 1 kWh = 1000 Wh). The average lifetime of incandescent light bulbs is about 750–1000 hours. It would take at least between 6 and 11 incandescent bulbs to last as long as one compact fluorescent, which has an average lifetime between 11,250 and 15,000 hours. This causes an additional total cost of using incandescent bulbs. Another additional (potential) cost may be incurred if the bulbs are not in a readily accessible location and special equipment (such as a cherry picker) and/or personnel are needed to replace it. This means that a 5 percent reduction in operating voltage will more than double the life of the bulb, at the expense of reducing its light output by about 20 percent. This may be a very acceptable trade off for a light bulb that is a difficult-to-access location (for example, traffic lights or fixtures hung from high ceilings). So-called "long-life" bulbs are simply bulbs that take advantage of this trade off. According to the relationships above (which are probably not accurate for such extreme departures from nominal ratings), operating a 100-watt, 1000-hour, 1700-lumen bulb at half voltage would extend its life to about 65,000,000 hours or over 7000 years—while reducing light output to 160 lumens, about the equivalent of a normal 15 watt bulb. The Centennial Light is a light bulb which is accepted by the Guinness Book of World Records as having been burning almost continuously at a fire station in Livermore, California since 1901. However, the bulb is powered by only 4 watts. A similar story can be told of a 40-watt bulb in Texas which has been illuminated since September 21, 1908. It once resided in an opera house where notable celebrities stopped to take in its glow, but is now in an area museum. In flood lamps used for photographic lighting, the trade-off is made in the other direction. Compared to general service bulbs, for the same power, these bulbs produce far more light, and (more importantly) light at a higher color temperature, at the expense of greatly reduced life (which may be as short as 2 hours for a type P1 lamp). The upper limit to the temperature at which metal incandescent bulbs can operate is the melting point of the metal. Tungsten is the metal with the highest melting point. A 50-hour-life projection bulb, for instance, is designed to operate only 50 °C (90 °F) below that melting point. Lamps also vary in the number of support wires used for the tungsten filament. Each additional support wire makes the filament mechanically stronger, but removes heat from the filament, creating another trade-off between efficiency and long life. Many modern 120 volt lamps use no additional support wires, but lamps designed for "rough service" often have several support wires and lamps designed for "vibration service" may have as many as five. Lamps designed for low voltages (for example, 12 volts) generally have filaments made of much heavier wire and do not require any additional support wires. A light can waste power by emitting too much light outside of the visible spectrum. Only visible light is useful for illumination, and some wavelengths are perceived as brighter than others. Taking this into account, luminous efficacy is a ratio of the useful power emitted to the total radiant flux (power). It is measured in lumens per watt (lm/W). The maximum efficacy possible is 683 lm/W. Luminous efficiency is the ratio of the luminous efficacy to this maximum possible value. It is expressed as a number between 0 and 1, or as a percentage. However, the term "luminous efficiency" is often used for both quantities. Two related measures are the overall luminous efficacy and overall luminous efficiency, which divide by the total power input rather than the total radiant flux. This takes into account more ways that energy might be wasted, and so they are never greater than the standard luminous efficacy and efficiency. The term "luminous efficiency" is often misused, and in practice can refer to any of these four measures. The chart below lists values of overall luminous efficacy and efficiency for several types of incandescent bulb, and several idealized light sources. A similar chart in the article on luminous efficacy compares a broader array of light sources to one another. Thus a typical 100 W bulb for 120 V systems, with a rated light output of 1750 lumens, has an overall efficacy of 17.5 lumens per watt, compared to an "ideal" of 242.5 lumens per watt for one type of white light. Unfortunately, tungsten filaments radiate mostly infrared radiation at temperatures where they remain solid (below 3683 kelvins). Donald L. Klipstein explains it this way: "An ideal thermal radiator produces visible light most efficiently at temperatures around 6300°C (6600K or 11,500°F). Even at this high temperature, a lot of the radiation is either infrared or ultraviolet, and the theoretical luminous efficiency [sic] is 95 lumens per watt." No known material can be used as a filament at this ideal temperature, which is hotter than the sun's surface. ↑ TeraLab, Lamp Autopsy. Retrieved August 9, 2007. ↑ Frederick G. Hochgraf, Lamp Examination for ON or OFF in Traffic Accidents. Retrieved August 9, 2007. ↑ Matthew Josephson, Edison: A Biography (McGraw Hill, 1959). ↑ Trevor Williams and T.K. Derry, A Short History of Technology (Oxford University Press, 1960). ↑ California State Assembly Democratic Caucus, Assemblymember Lloyd F. Levine. Retrieved August 9, 2007. ↑ Conntact.com, Editorial: A Light Bulb Went Off Over Their Heads. Retrieved August 9, 2007. ↑ Associated Press, Edison's light bulb could be endangered. ↑ The New Zealand Herald, Standard light bulbs to be switched off. Retrieved August 9, 2007. ↑ Chinta Puxley, Ontario may ban old light bulbs. Retrieved August 9, 2007. ↑ CBC News, Nova Scotia ponders light bulb switch. Retrieved August 9, 2007. ↑ BBC News, Bulbs must be efficient 'by 2009.' Retrieved August 9, 2007. ↑ Expatica, No more incandescent bulbs. Retrieved August 9, 2007. ↑ Home Lighting and Accessories, Watts Up? A Parting Look at Lighting. Retrieved August 9, 2007. ↑ International Untion of Pure and Applied Chemistry, Spectrochemical. Retrieved August 9, 2007. ↑ Donald L. Klipstein, The Great Internet Light Bulb Book, Part I. Retrieved August 9, 2007. Howstuffworks - "How Light Bulbs Work." Livermore Bulb Webcam - light bulb on since 1901. Kruger, Anton, When Can LEDs Replace Incandescent Lamps. Kilokat's Antique Light Bulb Site, photos-history-discussion. Elmer G. Fridrich, inventor of the Tungsten Halogen Lamp. A Short History of the Invention of the Incandescent Light Bulb. History of "Incandescent light bulb"
This page was last modified on 28 February 2018, at 19:35.